Have you seen this ad before? The story, as I understand it, is that this commercial had been created in 1983, and was intended to run during the bowl games on January 1, 1984. It didn’t happen that way and was reserved to be aired Jan 22 during the Superbowl, but then didn’t pass approval from Apple’s higher-ups (not including Steve Jobs…he very much approved). The network was told to go ahead and sell the airtime to someone else. Well, at the last minute, some other company ditched and a spot was open. The network called Apple one more time and offered the space at a $200,000 discount (down from the $900,000 original price). Apple took the one remaining 60 second slot, knowing the board didn’t approve, and made advertising history. They insisted it would not ever run again, which started a huge nationwide buzz and soon everyone knew about the spot and wanted to see it. To my knowledge, it never aired again (at least not in the fashion of traditional TV advertising where a company actually PAYS for the ad to run rather than getting free publicity from all the news networks who were more than willing to show it multiple times), but of course, in this day and age it’s readily available. The ad is fashioned precisely after George Orwell’s novel Nineteen Eighty-Four first published in 1949. You just have to see it rather than have me explain anything! And of course, since I’ve never actually read the novel, I now have it in my possession thanks to the local public library. Also, you might as well pick up a copy of Buzzmarketing by Mark Hughes sometime. It has a much more detailed explanation of Apple’s ad strategy, or maybe lack of one, with regard to the aptly named ad, “1984″, introducing the new MacIntosh computer. Oh, I get it now since I’ve read the first part of the novel…”down with Big Brother”. Forgive my ignorance! Thank you for your interest in this blog. Everyone is welcome to read my consistently inconsistent posts regarding creativity, business tips, interesting links to follow, and whatever happens to come up. Since we’re just starting out here, I’ll say that I expect this whole endeavor to be mostly geared toward people who consider themselves the creatives of the world, but trust me, that doesn’t exclude ANYONE really. If you solve problems at home or at work and you have to “figure out” how to do it, you’re using creativity muscles to solve problems so you can join the club too. 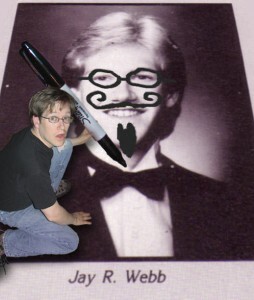 So WELCOME to the Voice Of Jay Webblog. I hope you find things engaging and at least mildly amusing.